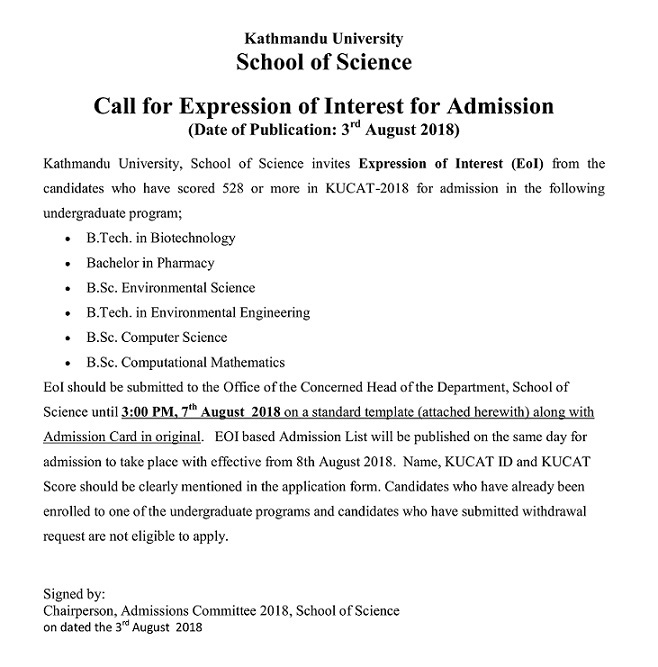 Kathmandu University Girls and Boys hostels are collecting applications from newly enrolled students through expression of interest in Schools of Science and Engineering. This is also the hostel application call for new BBIS students at Central Campus. To apply, please fill the attached form and email to respective hostel’s email. On the subject line of email please write exactly the EoI accommodation, 2018. To be eligible for the interview (Science and Engineering only) you must bring a letter from HoD or Program Coordinator stating that you are admitted to the Department or Program through expression of interest along with other requirements of interview in previous notice. Interview will be held as previously scheduled. Last date of application is 10:00pm August 13th, 2018. Applications from qualified, hardworking and result oriented professionals are hereby invited for following project management position. Good command over popular office packages G-suite/Microsoft. 1. Experience in research administration in multi-national scenario. 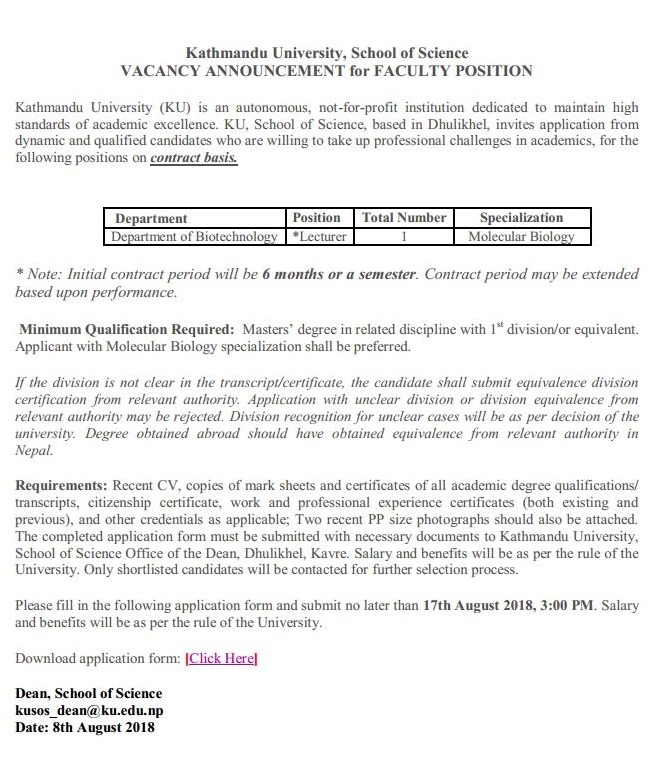 Application with a cover letter stating the motivation for desired position, complete curriculum vitae, copies of academic certificates and experiences/other-competencies should be submitted no later than 15 August 2018 4.00 PM Nepal time, by sending email with attachments to irdp@ku.edu.np. Short listed applicants will be called to appear for an interview for the final selection. 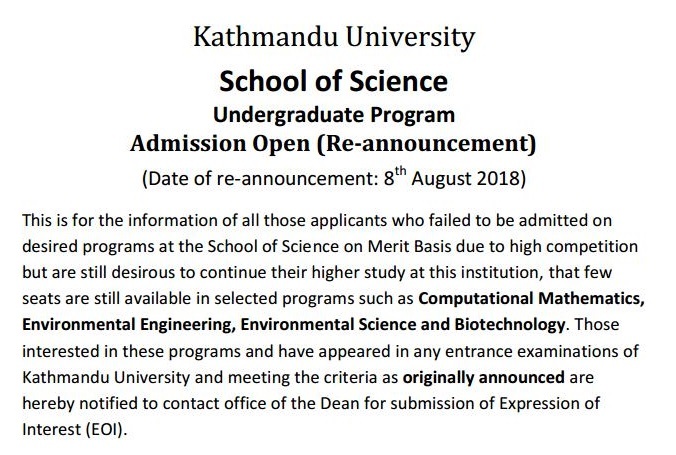 Kathmandu University School of Science (KUSOS) announces the admissions to Ph.D. in Natural Sciences (Physics, Mathematics), and Environmental Science. All eligible applicants are informed to fill the application form, pay required application submission fee, and submit to the concerned office of the Head of the Department no later than 7th September 2018. Candidate applying should have completed 18 years of education, obtained Master level in first division or a CGPA of 3.0 from any recognized universities. Admissions can be obtained both as Part Time or Full Time Research Scholar. It is notified that the following applicants of Undergraduate Admission-2018 in the School of Science at Kathmandu University are selected for document verification and admission or waiting in the programs as indicated below. Selected applicants are required to contact concerned department. Listed applicants are required to complete the admission process latest by 10th August 2018, 3 pm. 1) KUGH from August 14th to 15th, 2018. 2) KUBH from August 14th to 17th, 2018. 3) Interview will be conducted in respective hostels. Due to some technical flaws, the list of applicants from EOI has been revised for Verification & Admission. The Admission Committee appreciates your kind understanding and cooperation. It is notified that the following applicants of Undergraduate Admission-2018 in the School of Engineering at Kathmandu University are selected for document verification and admission in the programs indicated below. Selected applicants are required to contact concerned departments for document verification and admission from August 6, 2018 to August 8, 2018 between 10:00 to 15:00. In case of selected candidates could not be admitted, waiting candidates will be admitted as per merit basis so they are required to contact concerned departments from 15:00 to 16:00 on 8th August 2018. These candidates will be admitted on 9th and 10th August from 10:00 to 15:00 by concerned departments. PhD Defense of Mr. Karamat Ali, Department of Environmental Science and Engineering, School of Science. For unavoidable reason, PhD Defense of Mr. Karamat Ali, Department of Environmental Science and Engineering is shifted from earlier to dated the 3rd August at 11.30 am in Mini Auditorium of CV Raman Block. All interested are invited to attend. Dr. Bishnu Prasad Pandey, Assistant Professor of Department of Chemical Science and Engineering with his research team published the article entitled " Evaluation of alpha amylase , lipase inhibition and in-vivo pharmacological activities of Eucalyptus camaladulensis Dehn leaf extract" in Journal of Traditional and Complementary Medicine, published by ELSEVIER. The article covers evaluation of wide range of pharmacological activities such as anti-ulcer assay, anti-diarrhea assay, anti-inflammatory assay, analgesic assay as well as the enzymatic assay such as lipase inhibition and alpha-amylase inhibition activities of of Eucalyptus camaladulensis Dehnh leaf extract.